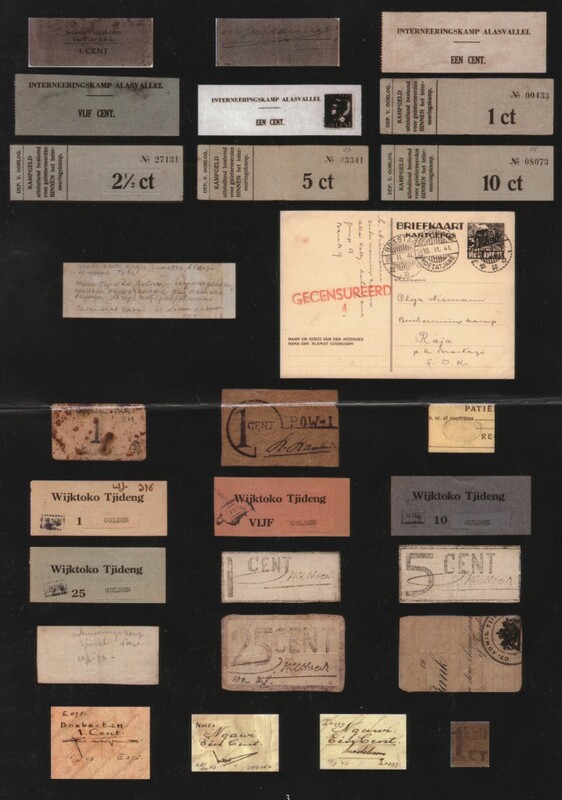 Camp money in the Netherlands Indies can be subdivided into two groups: camp notes that were issued by the Dutch authorities and camp notes issued during the occupation by the Japanese. 1. Camp money issued by the Dutch authorities. On May 10th, 1940 with the code “Berlijn” the Dutch authorities in the Netherlands Indies were informed that Germany had invaded the Netherlands. It was the beginning of the internment of German citizens in the archipelago. Both notorious national-socialists (nazi’s) and harmless Germans were interned pending further investigation. Preparation for this internment was very limited, in part to minimise the risk of leaking of information on measures to be taken. The only thing that had been decided was who should be arrested. The following locations were designated as initial temporary camps: the island Onrust in the bay of Batavia, the Ngawi military camp by Madioen (East Java province), a former shooting range at Takengon (for Atjeh and related areas), Pematang Siantar and Medan (Sumatra East Coast), Pagar Alam and Lahat (Palembang Residency), and Fort de Kock (West Coast Residency). In addition there were centres established at Sintang, Teloek Bajoer, Kandangang and Long Iram on Borneo, and at Sasaran, Menado, Sengkang and Makassar on Celebes. During a visit to Onrust on May 31th, 1940 Governor-General A.W.L. Tjarda van Starkenborgh Stachouwer noted the poor conditions in the camps and thus it was decided to build a central camp for men. The Germans insisted the camp be built in a cool climate and as a result the central camp was built in Alasvallei in South Atjeh. From this period we know of camp money from Fort de Kock and Alasvallei. Approximately 300 internees were housed in the “Opleidingsschool voor Inlandse Ambtenaren” (a school for training local government officials). One of the last transports to the central camp at Alasvallei was on February 22th, 1941 and came from the camp at Fort de Kock (now Bukittinggi). This camp had been kept functioning for this long because it was one of the best. Subsequently, it was used as a camp for German women who later were released when the Japanese conquered Fort de Kock. The first two items on the photo page (1) are the front and back of a camp note of 1 cent from internment camp Fort de Kock. On the back is a stamped signature which could be from sub-lieutenant Manuel who was the camp commander. This camp was built in 1940 and was known by the Dutch as Lawé Singala-gala. By the Germans it was known as Alasvalei or Kota Tjané (the name of the nearby town). All internees received an allowance of 10 cents a day. Those whose personal property was held by the “Weeskamers” (Courts of Chancery) could receive an additional 10 guilders a month in exchange for some personal effects. This made living somewhat easier. This was only possible for Germans who had possessions in the Netherlands Indies, mainly those who lived or worked there as for example clergy or planters on plantations. To get an idea of what one could buy with these amounts we can look at the price list of the canteen: bananas: 1 cent, lemonade and soda water: 10 cents a bottle, soap: 13 cents, toothpaste: 33 cents, a toothbrush: 5 cents, a shirt: 26 cents, chocolate: 9 cents, cigarettes: 10 or 12 cents a pack. It is likely that initially locally printed camp notes were issued. We see these first notes from “Interneeringskamp Alasvallei” (Internment camp Alasvallei) in pictures 3 and 4 depicting notes of 1 cent on white paper and 5 cent on blue paper. In picture 5 we see a 1 cent note with a Japanese occupation stamp affixed. The stamp is a 60 ct Sumatra machine T-overprint with an illegible cancel. As the cancel does not tie the stamp to the note this item is most likely a souvenir or a fantasy product. In pictures 6 through 9 we see the second series of camp notes. They were printed on security paper (if photocopied a honey comb design would show) with a square blind impression in the area where the value was printed (one can most clearly see this on the 2 ½ ct note). It is reasonable to assume this series was centrally printed under the authority of the Netherlands Indies for use in all the camps. Thus far, however, they are only known from the Alasvallei camp. Picture 10 shows the reverse side of the 10 cent note of picture 9. Here someone made a note, primarily in Russian, that this is camp money in use from 1940-1941 from Koeta Radja, Sumatra near the Toba lake. A similar note is found on the reverse side of the 1 cent note (picture 3). It is probable that these items were from a person who was released after the Japanese occupation and who returned to Germany via the Soviet Union. This route was used until the Germans invaded the Soviet Union on June 22th, 1941. A couple of these camp notes appeared a few years ago in the former German Democratic Republic and in Austria. Picture 11 shows a censored postcard from Karl Niemann from Alasvallei to Olga Niemann in “Beschermingskamp” (Civil internees camp) Raja. The internees were allowed to write a post card twice a week with a maximum of 100 words hand written or 175 words typed. The card was written on November 13th, 1941 at Koeta Tjané, cancelled “CDT Intern. Kamp Koetatjané” (Commander Internment camp Koetatjané), November 15th, 1941; Medan 15th, November 1941, 17:00 and Brastigi November 25th, 1941. From a note on the reverse side it appears the card was received by the addressee on November 27th, 1941. Karl Niemann writes he is in fine health, but that “Geld reicht kaum”, thus that he hardly had enough money. During the Japanese occupation, no Japanese camp notes were issued. However, the Japanese did issue their own bank notes, the well known Japanese Invasion Money (JIM-notes). This money was also widely used inside the camps. During 1942 a series was issued in Dutch with values of 1, 5, 10, 50 cents and 1, 5 and 10 guilders. In 1944 and 1945 new notes were issued in Malay and Japanese with values of 1, 5, 10 and 100 roepiah. Towards the end of the war a different note of 100 roepiah was issued on Sumatra. A 1000 roepiah note of the same design is also known but it is doubtful it was ever circulated. One should also note that money from other Japanese areas was also valid. In particular on Sumatra money from Malaya was frequently used. Coins of 1, 5 and 10 sen were minted but were not circulated on large scale. The Netherlands Indies coins and bank notes were also considered legal tender during the whole occupation period. There were a number of camps where the internees themselves issued camp money, some of it very primitive. These include the following. In picture 12 is depicted a 1 cent note from “Krijgsgevangen Bank P/19” (Prisoner of War Bank P/19). The note has two unknown initials and a signature which is probably that of Tempelman Plat. In picture 12 we see a 1 cent note from the (transit) POW camp located on the terrain of the 10th Infantry Battalion at Koningsplein, Batavia. POWs received these notes for work or services up to a maximum of 10 cents a day. The signature is that of the commander, lieutenant colonel L.F. Lanzing. In the book by Ogawa and others (see documentation), on page 100, the name mentioned is “Lanting”, which is probably incorrectly spelled. Tjimahi was a large garrison location near Bandoeng on West Java. Here the Japanese established an internment camp and several POW camps which functioned for several periods during the occupation. The former military hospital functioned as a general camp hospital. Three series of camp money are known from the various Tjimahi camps as follows. 2.3.1 Tjimahi, the “Kalen Koppen” camp (Bald Head Camp). 1. 1 cent on a square piece of bamboo with vertically “IK”(internment camp) with in between 1 and C to mean 1 cent. 2. 3 cent on a square depicting two poles and barbed wire with “KKK” (Kalen Koppen Kamp) and the number 3. It is doubtful if the 3 cent was ever circulated. There is an essay of a 2 cent in the same design (Bronbeek museum Arnhem, the Netherlands). 3. 10 cent with on the front “TMI” (Tjimahi?) and underneath 1942 with on the reverse 10 cent. 4. A picture of a cup of coffee with a plume of vapour forming the letters KKK. On the coffee cup is denoted “een koffie” showing its value as one cup of coffee. The Dutch camp leaders gave a few of these tokens each week to those prisoners which did not have money of their own. 5. A picture of barbed wire with through it the letters KKK and underneath the word “SHAG” (tobacco). In the beginning there was a small tobacco factory in the camp. The tobacco was packed in dried banana leaves. When purchasing a package one received a shag token. Ten such tokens could then be exchanged for a free package of tobacco. 2.3.2 Tjimahi, 4th and 9th battalion internment camp. In pictures 19 and 20 we see 1 and 5 cent notes with a stamped signature. In picture 21 we see the reverse of the 5 cent from picture 20 with the indication “Interneeringskamp Tjimahi 4de Bat. 22/6-’42-“. In pictures 22 and 23 we see the front and reverse of the 25 cent in this series. This camp note is made from an unused cheque. One can partly see a stamped “CT. ADMIE. TJI…” which probably stands for Commander Administration Tjimahi. This camp reached a maximum number of nearly 12.400 internees in October 1944. The military hospital was situated across from the enormous 4th and 9th battalion encampment. The camp remained administratively under the battalion jurisdiction until April 1945. Picture 14 shows a camp note made from a carton patient medical registration card. It does not indicate a value, only an oval stamp “Hospitaal (open cross) Tjimahi”. This camp note is from around 1944 and had a value of 10 cents. The women’s camp Tjideng was in effect a part of Batavia (in the West-Petodjo area) that had been transformed into an internment camp. Pictures 15 through 18 show a series of four notes that were valid in Wijktoko Tjideng (District shop Tjideng camp). These were notes of 1, 5, 10 and 25 cent over which were affixed new values in guilders. Because of the devaluation of the notes put into circulation by the Japanese, the lower values were no longer useful. The notes have impressions of Japanese coins. Two types of coins were used for this: the 1 shu silver coin (small, see the 1, 10 and 25 gld); the 1 bu silver coin (large, see the 5 gld). It appears these impressions were used as authenticity marks to prevent falsification. It is unclear whether the type of coin used was related to the value of the note. In any event on the 1 guilder note one finds both the small and large coin impressions. Picture 24 shows a hand written camp note of 1 cent from Boeboetan dated 15/2 ’43 with twice the serial number E 0751 and a signature. During the first months of the occupation this prison was a collection point for interned officials and other civilian men from Soerabaja, East Java and parts of Middle Java. To the extent they were not released (workers and Indo-Europeans with salaries less than 100 guilders per month) they were transferred to Ngawi end of February 1943. In the latter part of the year the prison was used primarily to intern non-Dutch nationals. In addition to being an internment camp, this prison was used as a normal prison during the occupation period. 2.6 Ngawi, East Java province (Dutch name: Fort van den Bosch). Pictures 25 and 26 show two hand written notes from Ngawi, serial numbers I 0399 and N 0153, both with differing signatures. The notes are dated 17/7 ’43 and 25/10 ’43, respectively. Fort van den Bosch (Van den Bosch fortress) functioned for several months during 1940 as internment camp for Germans, NSB party members (the Dutch nationalist-socialist (pro-nazi) party) and others who were deemed to be dangerous by the state and were arrested in May 1940 when Germany invaded the Netherlands. The fortress was from February 1943 to February 1944 a collection/internment camp for “European” men including many high level officials and employees from Middle and East Java. The transport from the Boeboetan prison from Soerabaja arrived in Ngawi on February 27th, 1943. This group was later transferred to the barracks of the 4th and 9th battalion at Tjimahi. 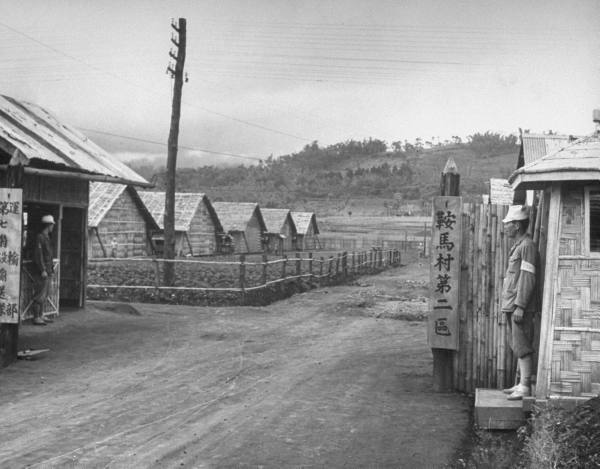 From the end of January 1945 the Ngawi camp was used for Indo-European boys, men and a number of young women who were arrested on suspicion of anti-Japanese activities. In picture 27 we see a camp note with “1 EEN CENT” (1 cent). Presumably it is from a camp in the Netherlands Indies. There is no further information available. (1) The items on the photo page are referred to numerically and should be viewed from top left to bottom right. With thanks to Nico L.M. Arkesteijn, William Barrett, Paul Bulterman, Manèl Garretsen, Pauljac Verhoeven (Bronbeek Museum) and Mathis Verkooyen for information about the topic. David B. August and Alim A. Sumana in friendschip based on many years of collecting together. Translations: Jan van Nieuwkerk and Hélène Engelkamp. De Beeldenaar (1977), nr 5, Pag. 13. Catalogue from the exposition Oeang, ruil- en betaalmiddelen Indië, Museum Bronbeek, Arnhem 1999. Campbell, Lance K, Prisoner of War and Concentration Camp Money, Port Clinton, Ohio, 1993. Dulm, J. van, a.o., Geïllustreerde Atlas van de Japanse Kampen in Nederlands Indië 1942-1945, 2 parts, Zierikzee 2001 – 2002.